Q: What are the differences between the US DVD Version and the HongKong Version? 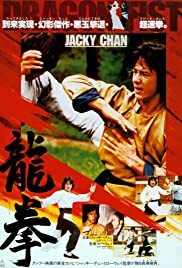 Lo Wei's moulding of Jackie Chan into the new Bruce Lee' was never more prevalent than in this schlocky kung fu time-waster, an undemanding piece that takes itself just a bit too seriously. Chan plays the downhearted student type desperate to seek vengeance for his teacher's death, beaten at the hands of a rival master. There's also something about the criminal Wei Clan smuggling and pillaging this and that, but the overall lack of excitement really makes this one a bit of a drag. Jackie is of course the saving grace, but Dragon Fist is undoubtedly a dreadful waste of his talents.